Rahm Emanuel is using Chicago City Workers for backdrops and photo ops to bolster his run for the upcoming Mayoral Race. City Workers were attempting to pick up garbage and complete their tasks when a Commissioner ordered them to wait all morning for Rahm Emanuel and the Chicago Media to take pictures for the news. City Workers that were black and Hispanic were ordered to the front for pictures. 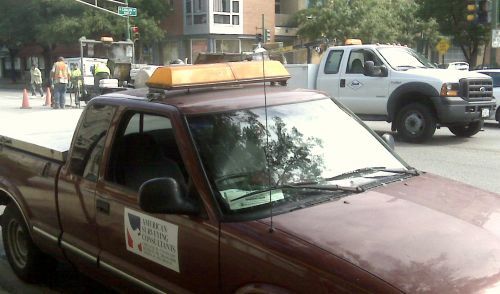 Workers wore City Uniforms and the trucks were clean as a whistle. One City Worker said, he did not see a fly or a foul smell for once. This beats pickin up trash said one employee. The Inspector General has told Rahm and City employees to keep away from the press. The Law Department is very angry as Rahm is making lawsuits against the city run afoul. Rahm used the Water Department for photo shoots for years. It is a backdrop for votes. 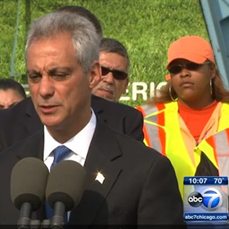 One City commissioner said” it is Rahm being Rahm”. The Inspector General is still not going after Rahm for using City funds for his personal use. Joe said, “I still got a job”. Photo by Nancy Stone of the Tribune. Chicago Election Board Chairman Langdon Neal makes millions and millions of dollars from the City of Chicago and Cook County. Jay Stone is becoming a major thorn in the side of the Chicago newspapers big secret. Landon Neal’s legal deals stink real bad. A conflict of interest at the very least. Langdon was again hoping people in Chicago will register to vote for Barack Obama and that is what made the newspapers. What? Why will the Chicago Sun-Times keep a lid on Langdon Neal’s business dealings? I tangled personally at Rahm Emanuel’s residency hearing with Langdon Neal. If you want some great dirt on Chicago politics and Langdon Neal go to Jay Stone’s website. The Celtic Knot is a wonderful Irish Restaurant in Evanston, Illinois. It has wonderful food and tonight January 21, 2010 was visited by a wonderful and enthusiastic group of Democrats supporting David Hoffman for U.S. Senate. Davis Hoffman was joined by two young Irishman that are some of his most excited supporters. Michael and David McDonough told me they are telling all their friends to have their parents vote for Mr. Hoffman in the election just a few short days away. I hope all of you well educated voters make sure you tell everyone to vote this primary election. I also agree with my children and will vote for David Hoffman. 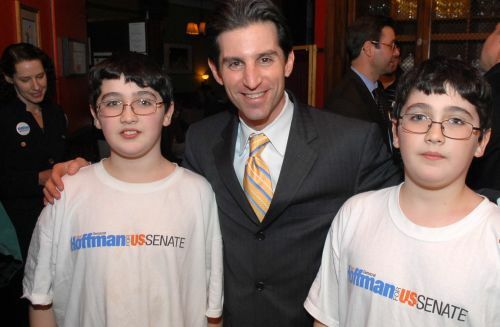 As a parent I reward my children for wise choices, I recommend all voters reward David Hoffman for making wise decisions while in public service. I must admit, candidates like David Hoffman give all of us a reason to go to the polls and vote. David Hoffman was also joined by Chicago City Workers tonight including teamster local 700 leader Angelo Fata and Operating Engineer Saul Charak. Most of the people in attendance were very passionate in their support for David Hoffman. Photo by Patrick McDonough.